The Portsmouth Abbey School curriculum encourages our students to ask big questions: Who am I? What is my place in this world? Where am I going? How do I know? Our independent academic and co-curricular programming encourages students to develop reverence for God and the human person, respect for learning and order, and a sense of responsibility for the shared experience of community life. In this ever-evolving world, we work to strike a balance between forward thinking innovation and stability rooted in tradition as we prepare our students to engage in successful college careers and in the world beyond formal education. The Abbey prepares you for post-secondary academic work by providing you with a broad and liberal education in the Benedictine tradition. We foster crucial academic and life skills through a structured sequence of courses. Our curriculum celebrates the classics of the Western canon and addresses three fundamental objectives: to develop a common background of knowledge among students; to use the study of a classical language and ancient history to train students in disciplined thinking; and to give students a thorough grounding in and appreciation for the written and spoken word. The path to leading an examined life requires courage, curiosity, and commitment. Elite colleges, top graduate schools, and the most highly skilled professions demand of high school graduates what they have always demanded—outstanding skills of literacy, numeracy and reasoning, an ability to master content in core academic disciplines, a fluency in the cultural literacy of our Western tradition, and the initiative to work hard and to confidently manage one's own learning. Practically speaking, we offer a range of honors, accelerated, and AP core curricular and elective courses. The academic year is divided into terms—Fall, Winter, Spring—and each term ends with a formal examination period which determines twenty-five percent of the term grade. At the end of each term, grades and detailed comments from the student's teachers, houseparent, and athletics coach are reported to parents. 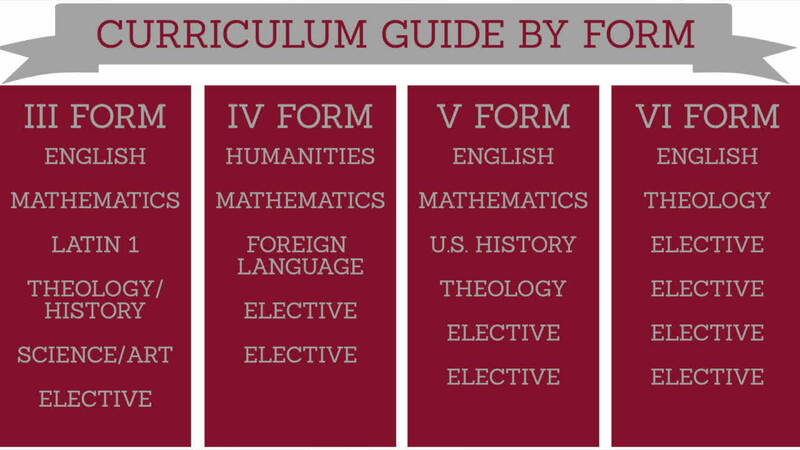 In addition to traditional secondary disciplines, we offer a number of electives to broaden your preparation for college, including offerings in the fine arts and advanced work in classical and modern languages.